Dr Onkar Dhanoya has a special interest in implant dentistry, cosmetic dentistry and sedation, particularly in treating nervous patients. He is a trainer for the Northern Deanery and an honorary clinical lecturer at Newcastle University Dental Hospital. Onkar is committed to personal continuing education and is currently on the pathway to the Fellowship of the Faculty of General Dental Practice at the Royal College of Surgeons. 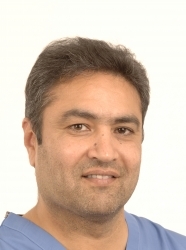 Dr Dhanoya is a member of the Association of Dental Implantology UK. He qualified from Newcastle University in 1985. Patients just beginning to think about dental implant treatment may find it helpful to attend a complimentary preliminary consultation with Dr Dhanoya the implant dentist. This appointment does not include a clinical examination and it only takes 15 minutes. The discussion will help you consider the options for treating your dental problems and decide whether to proceed to a clinical consultation for implants. The preliminary consultation is free of charge for visitors enquiring through this website. Please use the button in the right hand column to request an appointment. Once you have decided in principle that you want implant treatment, the next step is a clinical consultation. This includes a comprehensive oral examination, and results in production of a fully-costed individual plan for your treatment. The fee for the clinical assessment appointment and provision of your personal treatment plan is £100including X-rays\CT scans are £150. The cost of the treatment planning consultation is refunded when you proceed with the treatment. Honor Health offers advanced 3D imaging services and provides cosmetic dentistry treatments. Referrals are accepted from general dental practitioners for all types of dental implant treatment. Self referrals are also welcome. Honour Health is an established award winning practice located very close to Newcastle city centre. The practice offers a comprehensive range of services including dental implant treatment. Treatment is carried out by experienced, qualified professionals in a fresh, modern environment using state-of-the-art equipment.